Brian Haughton.com The Phaistos Disc - Ancient Artifact or Modern Fake? Over the last 100 years numerous attempts have been made to try and identify the ‘language’ on the Disc. In 1975, Jean Faucounau published a translation, maintaining that the language was a pre-Greek, syllabic writing of a culture he identifies as ‘Proto-Ionians’, a people with closer ties to ancient Troy than to Crete. According to Faucounau’s decipherment the Phaistos Disc describes the career and funeral of a Proto-Ioanian king called Arion. His translation has, however, not been accepted as sound by most scholars on the subject. In 2000, Greek author Efi Polygiannakis published (in Greek only at the moment) a book entitled The Phaistos Disk Speaks in Greek claiming that the inscription on the disk was written in the syllabic writing system of an ancient Greek dialect. Dr. Steven Fischer’s Evidence of Hellenic Dialect in the Phaistos Disk (1988) also identifies the text as syllabic writing in a Greek dialect. One clue to the meaning of the object is the context in which it was found. The fact that the Phaistos Disc was unearthed in an underground ‘temple depository’ has persuaded some researchers of its religious significance, suggesting that the text was possibly an ancient sacred hymn or ritual. Several image groups in the text are repeated, which would suggest a refrain, and perhaps each side of the disc represents a verse from a song, hymn or ritual incantation. In fact Sir Arthur Evans, excavator of Knossos, the ceremonial and political centre of Minoan civilization, concluded that the disc contained part of the text of a sacred song. The original discoverer of the disc, Italian archaeologist Luigi Pernier, also believed it had ritual significance. Nevertheless, though the Phaistos Disc was found at a Minoan palace site, there is no absolute proof that it originated on Crete at all, it may have been imported from just about anywhere in the Mediterranean or even from the Near East. While a religious / ritual explanation is certainly a possibility, it is only one of numerous so far suggested for the Phaistos Disc. Theories include: an ancient adventure story, an ancient calendar, a call to arms, a spell written in Hittite (a language used in north-central Turkey, c1600-1100 BC), a legal document, a farmer’s almanac, a schedule for palace activities, and a game board. In his 1980 book The Phaistos Disc: Hieroglyphic Greek with Euclidean Dimensions, German author Andis Kaulins claimed to have deciphered the mysterious script and maintained that the language of the Disc was Greek and that it contains the proof of a geometric theorem. However, Kaulins’ translation has found little support among archaeologists and linguists. 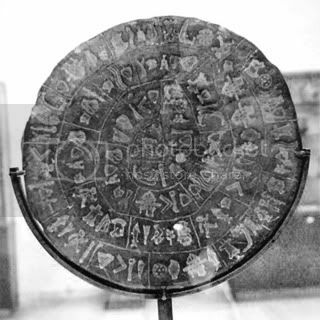 In his 1999 book The Bronze Age Computer Disc author Alan Butler postulated that the Phaistos disc functioned as an incredibly accurate astronomical calendar / calculating device. However, there is no explicit evidence that the Minoans had any detailed knowledge of astronomy, and even the ancient Egyptians’ comprehension of astronomy at the time was not detailed enough to support Butler’s hypothesis. Powered by WordPress v 4.9.10. Page in 0.226 seconds.